We don’t just do affordable social media management for small businesses… we offer a whole host more. Browse what other services we have on offer below. Blogging is at the core of any content marketing campaign and its importance remains high. However, posting regularly takes time and effort and can become a pain for small business owners to manage. Our solution is straightforward. We’ll take over your business blog, come up with content ideas, add stock photos and publish directly. Our pricing is simple. 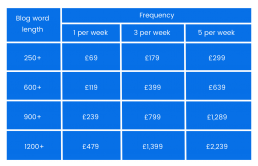 Our monthly prices for premium blog management are below. Just choose how long you want your blog posts to be and at what frequency. Yes, it’s so helpful for business in a variety of ways. In fact, small businesses with blogs generate 126% more leads and with 78% of consumers conducting product research online, it’d be wise to boost your presence. Here are the top 3 benefits of having a blog for your business. Blogging makes you irrevocably more findable on Google. Think about how many pages your website has, probably not many – right? And these pages won’t likely be updated very often either. This shows to Google that you aren’t that active, and with so few pages you don’t give yourself much of a chance. Blogging solves this: you become more active and your website gets a huge natural boost in the number of pages, which will be focused around the industry you are in, too – so it’s great for SEO. It helps people find you on search engines but your blog posts may also be shared around on social media, not just by yourself but by other people who may find it interesting. And, think about this long-term too. If consistently put out good content, it’ll get picked up by Google and you’ll start ranking for more and more terms in and around your industry. This’ll take time to build up but the effort put in now will pay dividends in the future. Rather than just hoping that more people will become customers as a result of reading your blog, you can add a simple lead-generating call-to-action (CTA). Often these CTAs can be offering something for free (like an ebook – check out ours here!) in exchange for the user’s email address, which you can then add to your mailing list and market to them in the future. It gives your business more authority. With a blog, your business can become an authority within your industry. If you make a blog that’s consistently helping potential customers and answering the burning questions people are likely to have, then you build up a solid reputation and look great to the customer. If the blog post appears on your business’ website and someone is actively looking to purchase a product or service your business has, you are able to build up so much authority and they’ll trust you before entering the sales process.